Work Center is the physical place in a manufacturing firm where different manufacturing processes are executed. 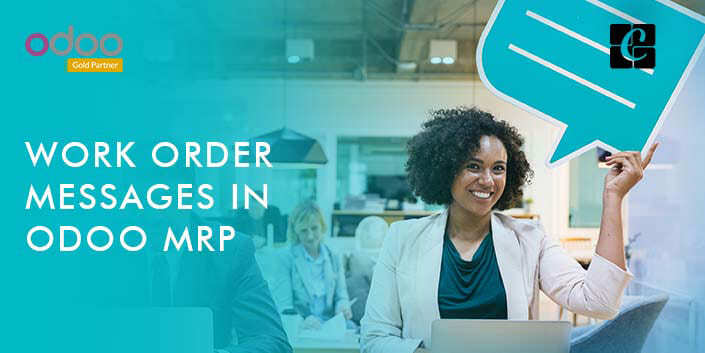 With Odoo MRP user can easily configure the work center details and perform the route based production in the industry. The user can avail and configure the work center details such as performance indices like its efficiency factor, production capacity and much more for analyzing the performance of each work center. The provision of showing custom messages in Odoo when a person open manufacturing work orders comes as an additional benefit in the manufacturing industry. It brings clarity on user’s interface enabling the easy planning process in manufacturing. The employees can efficiently handle their production and manufacturing process with custom work order messages in Odoo. Real-time notifications under work order simplify the performance of repetitive actions, also helps with a high degree of flexibility to update the default information and integration with quality controls. This blog discusses how to show custom messages in Odoo when a person open manufacturing work orders? Odoo provides a feature for configuring custom messages to show in work orders. Here is the workflow. Install Manufacturing module from Odoo app list. There you can see some extra menus under manufacturing after activating work order operations. First, you need to create Bill of material for the product to manufacture. Create Bill of materials from Manufacturing > Master Data > Bill of Materials. Select manufacturing routing from bill of material itself. Add operations and corresponding work centers under Work Center Operations tab in Routing. Let's create Work order messages, you can find the Work Order Messages menu under Manufacturing > Master Data. There you can select the product for you need to display a notification to users when manufacturing. You can limit the messages for a particular bill of materials or workcenters by selecting Bill of Materials or Work Centers in Work Order Messages. Now everything is set. Go to Manufacturing > Operations > Manufacturing Orders and create new manufacturing order and select product to manufacture. Click Create Work Orders button on the top of the page. You can see a super button visible on the created work orders. On clicking on the super button will direct you to the created work orders. Whenever you open the created work orders, it will be visible for you the custom messages that got created.